Tom Field (b. 1952) is a Contributing Editor at Sky & Telescope Magazine. He has been an amateur astronomer since Shoemaker-Levy 9 got him interested in 1994. He is also the developer of the RSpec/Real-time Spectroscopy software. In his "day-job," he is a developer and manager in a 100-person software company. Tom is a popular meeting speaker and can appear at your club. Rather than appearing in person, he uses web-based presentation software (WebEx) to project live video, audio, and his PowerPoint show. A picture is worth at least 1,000 words: check out this link for a short video sample of his presentation and the technology he uses. In 2008, finding that astronomical photography wasn't as exciting for him as it had once been, Tom went looking for a new activity in which he could use his astronomical "toys." Deciding to try something a bit more scientific, he chose astronomical spectroscopy. When he attached an inexpensive grating to a camera he already had, Tom discovered that he was easily able to capture fascinating spectra from his urban location. Unable to find a quality software program to process his spectra, Tom wrote a program for his own use. When he showed his software to other amateurs, they pressured him to make it more widely available. The result was his RSpec/Real-time Spectroscopy software, which is now in use on all continents, by amateurs and professionals, and in university and K-12 classrooms. Tom’s enthusiasm comes through whether he’s sharing the beauty of the Sun in a sidewalk astronomy session, or introducing his peers to the joys of spectroscopy. Recognizing that the amateur community is hungry for a new activity that engages and challenges them, Tom has become somewhat of an ambassador for spectroscopy. His article “Spectroscopy for Everyone” appeared in the August 2011 issue of Sky and Telescope Magazine. Dennis Di Cicco of Sky and Telescope also conducted a video interview of Tom at NEAF. See the video [link]. Tom's RSpec spectroscopy software was included in Sky & Telescope's January "Hot Products 2012" list as well as Astronomy Magazine's "New Products" list in their February 2012 issue. Tom has spoken at a large number of astronomical events, including the OPT SCAE Astronomy Faire, NEAF, NEAF Imaging Conference, two PATS conferences in LA, the Table Mountain Star Party, the OMSI Imaging Conference, the Winter Star Party, and at the Advanced Imaging Conference as a spotlight speaker. And, he has been the featured speaker at club meetings and star parties around the world. His well-received talks are lively, educational, and visually engaging. Tom has developed and fine-tuned a 40-minute presentation in which he covers the basics of spectroscopy, including: the history, science, tools, the results one can expect, as well as how to get started. In order to reach a wider audience, earlier this year Tom started providing on-line, live video lectures to astronomy club meetings. In his “day-job,” Tom has given hundreds of presentations over the web and in person, so he knows how to effectively use this technology. Because it’s a new approach, club board members are sometimes hesitant to have a meeting speaker give their talk via live video on the web. For that reason, Tom offers a short 5-minute preview of his talk so that board members can get a sense for how well this technology can work for them. 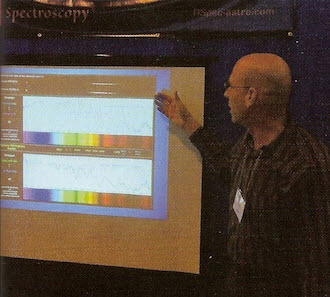 Tom would be happy to give his spectroscopy presentation to your club, over the web or in person. He has given remote webinar talks to clubs in the UK, South Africa and Australia and the US, so distance is not a factor. References are available. Tom does not ask for any fees or honorariums. 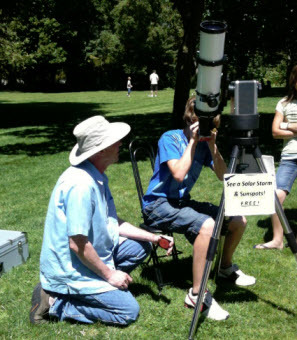 In his spare time, Tom enjoys doing sidewalk solar astronomy, as shown in the photo to the right. This page has been accessed 24,724 times.